Our speakers, facing from right to left, Patricia Kane speaking to Bob Van Dyke, Steve Latta speaking to Rick Roberts, and Alf Sharp. 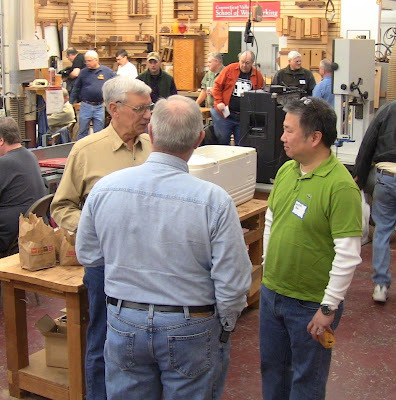 The March meeting of the Society of American Furniture Makers was held at Bob Van Dyke's Connecticut Valley School of Woodworking, Manchester, CT. There were two presentations, by Patricia Kane and Steve Latta, and one demo, by Alf Sharp. Freddy Roman and Mike Morton joined me for the drive. I enjoy these events as much for the chance to meet people and make connections as for the knowledge presented. In addition to Steve Latta, I met two people in person who I've met online, Wilbur Pan and Rick Roberts. Wilbur is among the group of woodworkers I communicate with on Twitter. Rick is a reader who's taken a number of classes at CVSW, including several from Steve Latta. 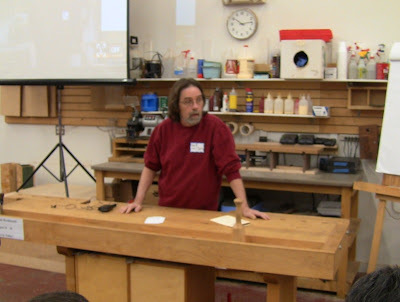 I'll be teaching a class at Rick's workshop in April for Rick and several of his friends. He also showed up wearing a Close Grain T-shirt! Thanks for the support, Rick! I'm looking forward to our April class. Wilbur Pan on the right. Rick Roberts is in the background in the orange shirt over his black Close Grain T-shirt. Bob Van Dyke calls the meeting to order. Freddy Roman started the meeting by announcing that the next meeting is May 5, at the North Bennett St. School. That's an opportunity not to be missed, one of the true values of membership! Freddy Roman, New England chapter coordinator. 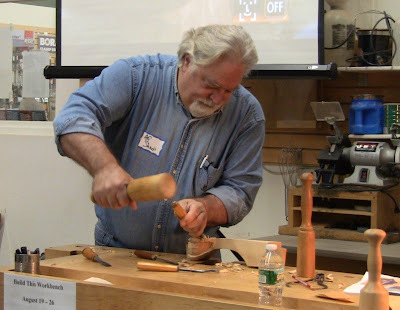 Next, Mickey Callahan discussed the upcoming SAPFM exhibition, "A Tradition of Craft", at the Connecticut Historical Society, Hartford, CT. This features current work by SAPFM members, running from March 30 to September 8. This is an opportunity to see truly beautiful craftsmanship recreating truly beautiful pieces. Putting on an exhibition like this is an expensive undertaking. Building display platforms, painting, mailings, and signage strain financial resources. Non-profits face an especially challenging environment in the current economy. You can help support the exhibition with a tax-deductible contribution large or small at the CHS online store. Your support will help make it a success and help ensure they can create future exhibitions. You can also buy tickets for the opening conference on March 31. The photo on the store page is of one of Freddy Roman's beautiful pieces, an example of the kind of work you'll be able to see. Mickey Callahan talks about the upcoming SAPFM exhibition at the Connecticut Historical Society. Patricia Kane gave the first presentation. She is the Friends of American Arts Curator of American Decorative Arts at the Yale University Art Gallery in New Haven, CT. Her talk was “A New Way to Look at Old Furniture: The Rhode Island Furniture Archive at the Yale University Art Gallery.” I didn't get another picture of her because the lights went off so we could see her presentation projected on the screen. Patricia has been assembling The Rhode Island Furniture Archive at the Yale University Art Gallery for 10 years. It includes a vast array of detailed information gathered from many sources. It's searchable web interface makes it an invaluable resource for those interested in the period furniture of Rhode Island. For instance, this entry shows the Townsend document chest I'm building through Al Breed's presentations to the Guild of New Hampshire Woodworkers. I was also interested to see that one of the researchers was Dennis Carr, who I met at the Boston Museum of Fine Arts during the WoodExpo 2012. After lunch, Alf Sharp demonstrated carving a ball-and-claw foot with pierced talons. As Alf said, every carver does this differently. It's always amazing to see an experienced carver at work, seeing the speed with which the piece takes shape. He said on a good day he can complete 4 or 5. Alf Sharp carving a ball-and-claw. Steve Latta gave the final presentation. 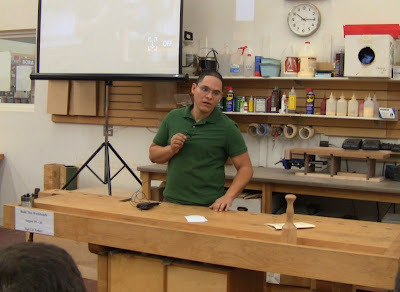 He's renowned for his Federal furniture work; Freddy Roman said Steve is the source of his passion for inlay. I have his excellent DVD, Fundamentals of Inlay: Federal Table Leg . 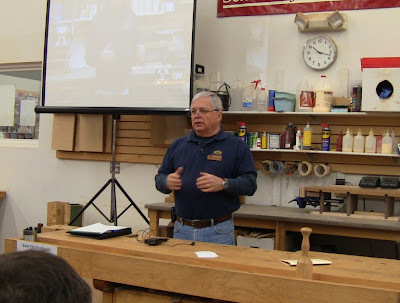 Steve's presentation covered historical aspects of inlaying by looking at the furniture and the people who did it, as recorded through historical documents like old newspaper advertisements and account books. He did this work as part of earning his Master's Degree. It provides another fascinating perspective similar to Patricia Kane's archive. I would love to see this work published. Another interesting person I met is Nick Kotula. 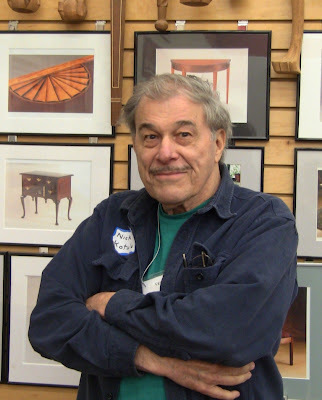 He wrote an article for American Period Furniture, SAPFM's annual journal, entitled The Nathan Margolis Cabinet Shop's Last Apprentice: Memories, Impressions and Lessons Learned. The Margolis shop was in Hartford, CT, and Nick was that last apprentice. The article offers a fascinating look at a way of life that no longer exists. That knowledge has almost completely died out, and we are having to resurrect it from scraps. The opportunity to talk to someone who still possesses it in the original is priceless. Nick said he's planning to write additional articles, which I eagerly await. He also has a number of beautiful old veneers from the 20's and 30's that he bought out from the Margolis shop and is now offering for sale. This is material of a type that may never be available again, a variety of exotic African and tropical species. He had some samples in his truck. Even after decades in storage, the unfinished grain glowed in the afternoon sunlight. I showed Nick the blog on my phone. The page I showed him was of my daughter learning how to build a dovetailed box. He was so impressed that a 17-year-old girl was interested in the skills that he invited me to bring her to his shop to show her around. 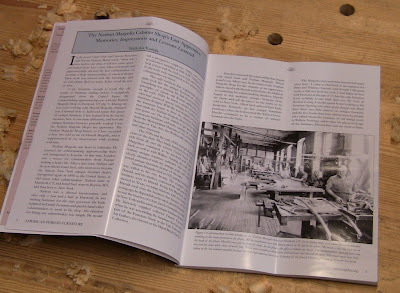 Nick's article in the 2011 issue of American Period Furniture, featuring photos of craftsmen at work in the 1920's. 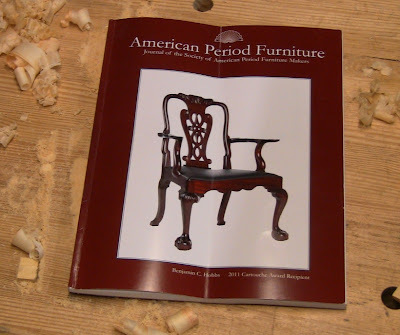 The annual American Period Furniture is one of the benefits of SAPFM membership, combining history, techniques, and profiles. 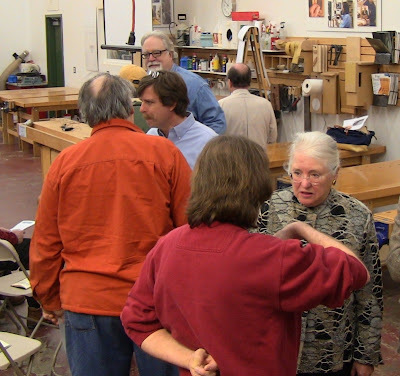 SAPFM membership is open to anyone interested in period furniture, whether you are a maker, a restorer, a collector, or just enjoy learning about the history of these beautiful pieces, from hobbyist to professional. Wow, Steve. It looks like you guys had a great time. I wish I could have made it up. Thanks for sharing it here. Steve, thanks for the kind words. Every one I know like your photo of me. Thanks again. Hope you will be at CHS next week. My windsor chair painted yellow is in the exhibition. Let me know what you think of it. 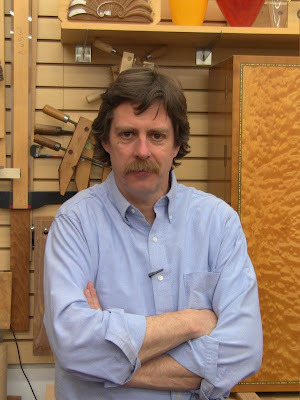 The exhibit, "A Tradition of Craft: Current Works by the Society of American Period Furniture Makers" is on view from March 30 - Sept 8, 2012 at CHS.